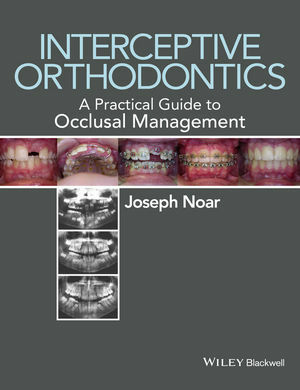 Interceptive Orthodontics: A Practical Guide to Occlusal Management aims to guide the practitioner in the art of interceptive management of the developing dentition. The goal is to guide the permanent dentition into the line of the dental arches, avoiding complex orthodontic treatment for teeth displaced far from their ideal position, and thereby reducing orthodontic treatment time. This book covers growth of the jaws and tooth development, and explains the correct timing of interceptive management. It also discusses orthodontic assessment, special investigations and comprehensive management of the mixed dentition, taking in the issues of early crowding, impaction, supernumerary and supplemental teeth, dental arch expansion, space maintenance and space management. In line with best available evidence, it provides clear treatment objectives and detailed treatment planning advice. Practical, accessible and illustrated with a wealth of colour images, this is an ideal clinical companion for general dental practitioners, oral surgeons, paediatric dentists and orthodontists. It is also a valuable reference for all training grades. Mr. Joseph H. Noar is a Consultant/Honorary Senior Lecturer in the Orthodontic Unit at the Eastman Dental Hospital, London, UK. He qualified in Dentistry at the University of Manchester in 1981, completed his postgraduate specialist orthodontic training at the Eastman Dental Institute in 1988, and was appointed to his current post in 1993. Mr Noar is first and foremost a clinician but has always been involved in orthodontic research and the development of the specialty in the UK. He lectures nationally and internationally, has published widely and teaches on the postgraduate orthodontic training program at the Eastman Dental Institute. He has served the British Orthodontic Society in various capacities for many years.